Stephanie is heading into her Junior year at the University of Texas, Dallas, as a Neuroscience, Pre-veterinary major. Ever since she can remember, Stephanie has wanted to be a veterinarian and eventually have her own practice. 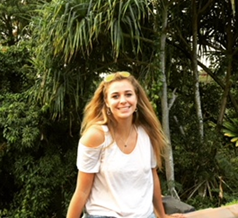 She is hoping that this summer she will be able to acquire experience working with and researching wild primates, to see if that could be incorporated into her career path in the future. In her free time, Stephanie loves hiking, playing sports, reading books, and of course hanging out and playing with all of her pets. She is extremely excited to get to Peru this summer!